The moment you enter the turquoise waters of Arrecife’s locally renowned beaches, you’ll understand that this world-famous hidden gem is one of the finest budget vacation destinations in Palea. A lush coral forest will take your breath away. Meet many of our friendly locals, and culturally enrich yourself by mingling with the nonhuman sapients who make this beachfront empire their secret home. Meet our beloved Forest Fairy family face-to-face in their unmatched beach habitat. For two decades, our beach has been a place to experience the sun. Come down to it and experience the water while experiencing some of our local dining. Enjoy water sports in our fabulous beach or reasonably priced brothels, and lie back with a cool beer and a warm towel, or just watch the sun go down as you prepare for a night on the town looking at the stars. 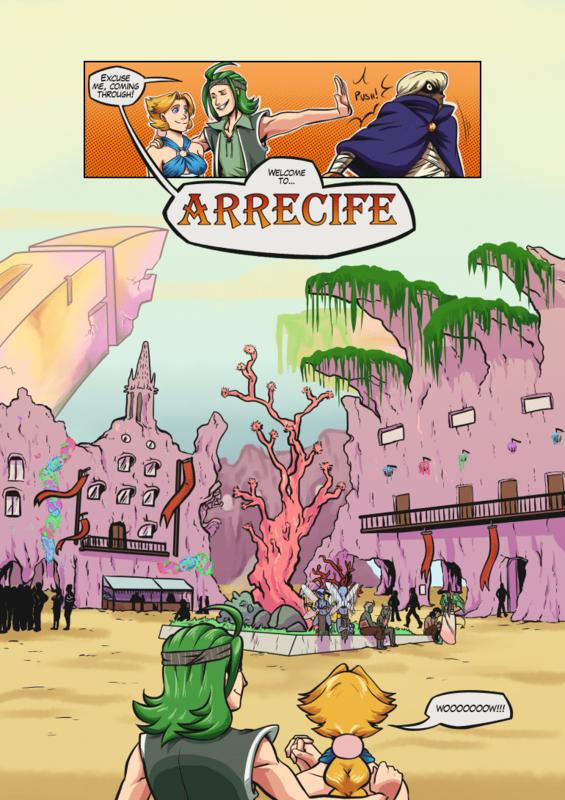 No matter what you choose to do, you’ll discover what many others have – Arrecife, an experience! Awwww! You mean Wolf IceRayzor StryderBloode wasn’t important at all?! Bait n Switch! Y’know what? Wolf doesn’t need your comic. He’ll make his own comic with blackjack and hookers, where he saves the day by being badass and using a sword that’s made out of light! He’ll be cool and distant with no real personality yet for some reason all the girls will want him! You’ll see! Don’t you mean a sword made out of dark, like the dark darkness of his soul? I can’t believe the town’s name is, literally, “A Reef”. The coral, seaweed and giant ruined stone arches aesthetic reminds me of Orr in Guild Wars 2. Notice the blond girl has no visible scar. This may be the angle, or our mysterious friend misjudges the shot he takes and it goes completely through the green haired douche’s head and scares the poor girl. What a Fine Deep Dish!